In a context of pressing environmental challenges, developing countries are facing the haunting task of balancing the achievement of economic development goals, particularly in the poverty reduction front, with the need for environmental sustainability. This challenge is especially serious for countries that are highly dependant on agriculture, often the most vulnerable to the impacts of climate change and variability. With the increasing frequency and severity of droughts and floods, extreme weather events and the associated impacts on food security, human health and biodiversity loss, the need for innovative approaches to sustainable development, including the use of ICTs, is gaining renewed momentum. An article recently published in the Sustainable Development journal, titled “Achieving Environmental Sustainability and Growth in Africa: the Role of Science, Technology and Innovation” (Webersik and Clarice, 2009), discusses this very issue. The authors argue that advances in science and technology solutions such as remote sensing, ICTs, biotechnology and transportation, are having important development implications, which are key to achieve the goal of sustainable development while maintaining or improving the environmental performance of African countries. In relation to the use of ICTs, the article points out the role of applications such as handheld computers, smartphones and global positioning systems (GPS) in the provision of a sustainable data flow in developing countries, as well as in the monitoring of environmental, energy, disaster management and other issues related to global warming. It also refers to the role of mobile technologies in the provision of market access for rural farmers, and their contribution to local empowerment and productivity. However, it also recognizes that the opportunities and risks associated with the use of emerging technologies are often met with skepticism and a narrow understanding of their development potential, which has limited their effective use in the development field. This challenge becomes evident when reflecting on the emerging role of ICTs in the response to climate change, and the increasing need to convey their potential to policy makers and development actors working in mitigation, adaptation and monitoring strategies. Although the article is based on the analysis of sub-Saharan Africa, many of the environmental challenges identified correspond to those faced in other developing regions, and the conclusions drawn are equally relevant to their contexts. Issues such as deforestation, declining soil productivity, pollution, freshwater scarcity or increased social vulnerability, among others, are also at the forefront of development agendas in Asia and Latin America. The adoption of Science and Technology policies must be informed by environmental perspectives that are directed towards sustainable growth and development. The implementation of new technologies must be linked to the improvement of local livelihoods and the need to overcome the basic problems of poverty, hunger and alienation. The effective implementation of ICT related initiatives is closely linked to the availability of capacity building/higher technical education opportunities, and supportive institutional frameworks. The authors conclude that higher priority needs to be given to scientific research and environmentally sound technologies. They also emphasize the potential of new ICT applications to meet basic needs in fields such as agriculture and health, and contribute to environmental management. The challenge of finding solutions that enable and foster economic development while sustaining the environment is not new in the development arena. However, we now have the added task of demonstrating the value that innovative approaches, such as the use of ICTs, can have in improving the capacity of vulnerable countries to better mitigate, adapt and monitor the changing climate. 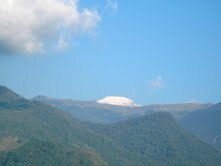 Note: The picture is the ¨Nevado del Quindio¨ (Snow Peak of Quindio) in Colombia. WEBERSIK, C. & CLARICE, W. 2009. Achieving Environmental Sustainability and Growth in Africa: the Role of Science, Technology and Innovation. Sustainable Development, 17, 400-413.